A high-pressure sprinkler pipe burst inside a fourth-floor custodian’s closet in the Columbia Road campus of St. John Paul II Catholic Academy a week ago Monday night, sending a cascade of water throughout the former St. Margaret’s school building, destroying large sections of classroom space, and leaving the campus’s main building “uninhabitable.” Repair costs will likely run into the millions of dollars and take many months to complete. More immediately, the incident triggered a crisis for school officials and their church partners, who scrambled last week to relocate more than 350 students and faculty members as a return from February vacation loomed. By the weekend, a plan had been devised to keep the school’s youngest pupils housed on the Columbia Road campus in a newer annex building that was not damaged in the flooding. Students in grades 2-8, however, were scheduled to attend classes beginning yesterday (Wed., Feb. 25) at a nearby church-owned building on Dorchester Avenue just over the bridge in South Boston. “This is a good option and we just have to expedite moving some things into the buildings,” said Rev. Jack Ahern, pastor of Blessed Mother Teresa parish, who has been engaged in assisting the Academy in managing the week-long crisis. Ahern also enlisted the help of Mayor Martin Walsh, a graduate of the old St. Margaret’s School, who directed his lieutenants to expedite an occupancy permit that was needed to keep the youngest students – in grades K-0 through 1 – housed in the annex beginning today (Thurs., Feb. 26). Ahern also worked with Cardinal Sean O’Malley’s office to secure space inside the former St. Mary’s School at 52 Boston St., which is owned by the parish of Our Lady of Czestochowa. The former school building was considered the best alternative space available because of its proximity to Columbia Road. St. Mary’s was closed in 2009, but the building is used on the weekends for parish events and Polish language classes. Workers remove damaged walls inside old St. Margaret School building: Photo by Bill ForryOn Monday, scores of workers in protective suits and hardhats hauled debris out of the school building and into large dumpsters in the school parking lot; inside, as hundreds of drying fans whirred, other workers ripped out ruined drywall and flooring while looking to salvage what they could. Meanwhile, Father Ahern toured the building with officials from Suffolk Construction, who had arrived to survey the damage and prepare preliminary plans for repairs. Suffolk built the annex and renovated the old St. Margaret’s building in 2008-2009. The company’s owner, John Fish, and his wife Cyndy were major contributors to the philanthropic efforts to build the Academy. A floor of the annex— which includes a gymnasium and several classrooms— is named for Fish and his wife. 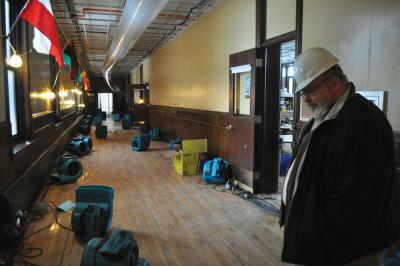 The flood was discovered around 6:30 a.m. a week ago Tuesday by the school’s main custodian, Tony Hutchins. The 25-year-old Savin Hill resident arrived at about the same time as Boston firefighters, who had been notified of a report of an alarm going off inside. In fact, Ahern and other neighbors later said, the alarm had been activated around 10 p.m. on Monday night— evidently triggered by the pipe break. By the time of Hutchins’s discovery some eight hours later, up to four inches of water had risen on each of the four floors of the building— compromising the walls, the ceilings, and the wooden floors. “When I walked in it was overwhelming at first. A lot of the ceiling tiles had dropped. You could tell it was bad,” said Hutchins. The source of the water was quickly pinpointed as being in a cavity above Room 403 — the custodian’s closet— where a pink elbow pipe had fractured. The archdiocese of Boston called in a professional disaster relief company – ServiceMaster by Gilmore – to respond to the scene. The Framingham-based affiliate of the international company brought in a large generator that is now the source of power for the extensive cleanup effort inside the building. After the pumping-out of a large quantity of water, the work is now focused on identifying sections of wall and flooring that must be removed because they are too water-logged to be salvaged. 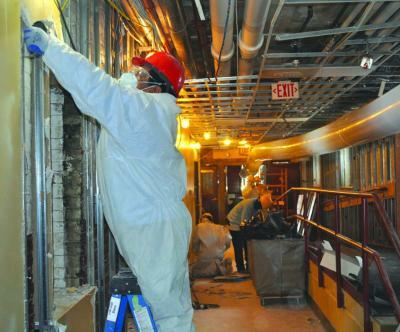 In fact, on Monday, several workers were seen tearing down whole sections of the first-floor hallway near the school’s main entrance, exposing the building’s exterior brick wall. Gilmore said it was too early to say just how costly the damage will be. “I don’t have a number yet, but it’ll be in the millions,” he said, noting that the company responded quickly — despite the heavy demands from other weather-related emergencies— because it does a lot of work for the archdiocese.